By now, you have heard of the great solar flare of 1859 that set telegraph wires afire across the US and Europe. This phenomena was due to a large electro-magnetic pulse from the earth’s magnetosphere interacting with the particles from a Coronal Mass Ejection (CME) caused by the solar flare. The long stretches of wire suspended above the earth acted like a large generator winding cutting through the magnetic field, which in turn caused voltage (Electro-magnetic force or EMF), which in turn, caused the fires. In 1859 our understanding of electricity and magnetics is not what it is today, thus, the fires were likely caused by over loaded conductors with out means to bypass excess electrical energy to ground. Fast forward to today. We are in the upswing of solar cycle 24, which is expected to peak in May of 2013. NASA predicts that this will be lowest sun spot peak since 1907. That does not necessarily mean the coast is clear. Over the last 11 years since solar cycle 23 peaked, computers and electronic automation have proliferated exponentially, becoming the norm. Things like GPS not only guide clueless travelers where to turn, but also sync up all those cellular telephone transmitters with timing signals. IP networks, SCADA, telephone networks and so on all run on some form of CPU. Newer Energy Star appliances like toasters and refrigerators also have CPUs. That technology has yet to experience a large electro-magnetic pulse (EMP) in the real world. Things could indeed get hairy if a moderate to large class X solar flare generated a CME that was polarized correctly to interact with Earth’s magnetic field and cause damage at ground level. Solar flares and CME are slow moving events, with 1-2 days warning before the effects of a CME reach earth. One can stay apprised of solar flares and other solar activity by subscribing to NOAA Space Weather Prediction Center’s email service. Of greater concern is other sources of EMP like high altitude nuclear explosions (HEMP). Those types of events, while rare, can happen. The good news is, the defense mechanisms for solar flare, high altitude nuclear burst and lightning induced EMP are the same. They are effective grounding, shielding, filtering and surge suppression.1 Of the three EMP scenarios, high altitude nuclear burst has the tightest design spec, so creating a building that incorporates the ideas in MIL-STD-188-125-1 specifications is a good start. Lightning strike – 1:1 Any radio station that has a tall structure, particularly a steel tower, will get struck by lightning, perhaps several times per year depending on the region. High Altitude EMP – 1:30 Based on seventeen high altitude tests carried out by the US and USSR in 1962, the growing nuclear proliferation and a June 2005 Reuters article “Experts warn of substantial risk of WMD attack” in which the author stipulates a thirty percent risk of a nuclear attack of any type in the period of 2010 to 2015. Suppression deals with those connections to the areas outside of the facility. These include incoming electrical service, data service and RF transmission lines to and from antennas. Since the fast component of the HEMP falls within the VHF spectrum, FM broadcast installations are particularly vulnerable. Suppression devices for incoming AC power are readily available from commercial sources and are well proven. LEA makes a series surge suppressor that uses a combination of fast acting silicone diodes, MOVs and an LC filter made up of series inductance and parallel capacitance to ground. The LEA DYNA family series surge protectors have a system response time of less than one nano second and are tested to greater than 1,000 operations.4 The response time depends on a good, non-inductive ground connection. Suppression for incoming RF and data cables is more difficult because the normal operating frequencies fall within the HEMP rise time frequency. Incoming data at a transmitter site usually consists of a DS-1 circuit however, larger capacity circuits are sometimes used. Fiber optic cables are immune from HEMP as they have no metal conductors. Copper data lines must have a data line surge suppressor between the TELCO demark and the CSU. RF cables must have their shields ground to the zone 0 ground, then go through a ferrite toroid to add inductance to the outer shield and isolate it from the zone 1 ground. After the ferrite toroid, a gas discharge type inline surge suppressor should be used. These come in a variety of configurations, frequency band and power levels. It is best to keep the suppressor rating as close to the peak carrier power as possible, affording the most protection to the transmission equipment. Of the four strategies for mitigating HEMP; Grounding, Suppression, filtering and shielding, shielding is the hardest and most expensive to implement. Good grounding should be included in any good radio station design same as suppression and filtering. Grounding. 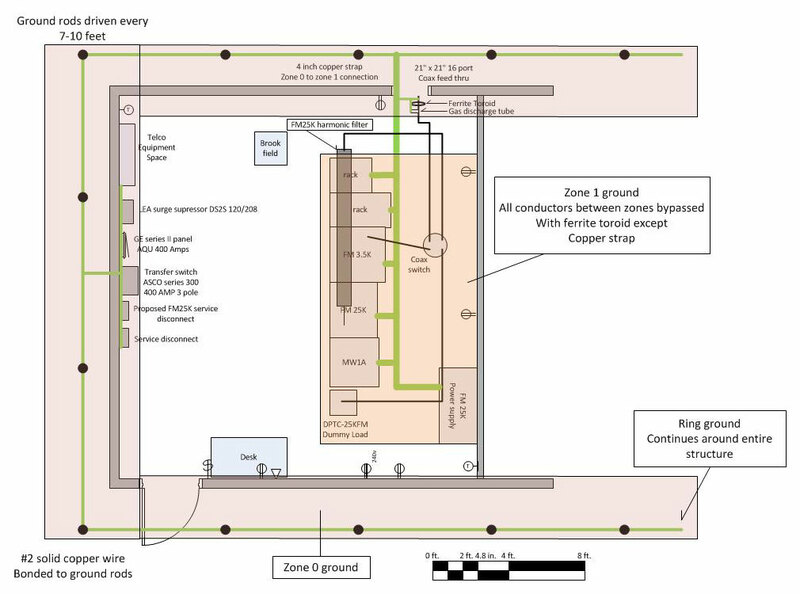 Grounding for a transmitter site must include an outside ring ground around the periphery of the building.2 This is bonded to several ground rods installed at regular intervals. The ground is brought into the building and all coax shields, electrical service entrance, TELCO equipment, suppression equipment and safety grounds are connected to it. This forms the zone 0 ground. 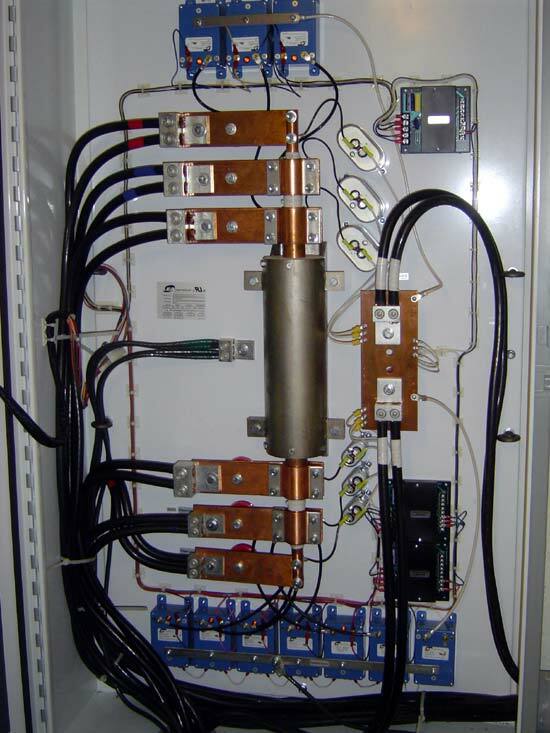 One conductor then goes to the zone 1 ground which is the transmitters and racks. Any other conductors at any potential that go from zone 0 to zone 1 are bypassed at EMP frequencies by use of ferrite toroids or other high mu ferrous metal filters. Inductors may need to be bonded to ground to prevent saturation. At studio locations, the building electrical safety ground should be evaluated for adequacy. Additional grounding may need to be installed depending on effectiveness of existing ground. Any outside antennas, supporting structures, satellite dishes and generators need to be bonded together and grounded to the building electrical grounding system. Studios and engineering rack rooms need to be bonded to the ground using star topology. Facilities that are not adequately grounded should be retrofitted. Suppression and filtering. Good surge suppression and filtering should be a part of all transmitter and studio site designs. Hanging a few MOV’s off of the service panel is not enough to prevent damage to a facility. All incoming lines from the street; electric, telephone, and cable need to have surge suppression connected and be bonded to a low inductance path to ground. The only exception to this is fiber optic, which is immune to the effects of EMP. Additional layers of filtering for sensitive, mission critical computer systems such as FERUPS, shielded category wiring that is properly installed, etc. Facilities that do not have adequate suppression can be retrofitted. Shielding. Shielding is the most expensive, time consuming and difficult to install correctly. The High Altitude nuclear test Starfish Prime in July of 1962 produced a field of 5600 V/m in Honolulu, some 1300 KM away from the blast. Building a shielded structure against those intense magnetic and electrical fields is very difficult. Attenuating the field through layers of shielding is the most effective means provided the distance between the shields is wavelength/6 or more (about 27 inches at 72 MHz) to prevent coupling.2 For example, using a concrete structure with steel mesh creates 35-40 dB of attenuation in zone 0, a well designed transmitter with good RF shielding in it’s cabinet design creates a shield for zone 1. Equipment racks can also be used to create shielding zones by using copper or brass mesh with good metal to metal contact around front and back doors. At studio locations, engineering rack rooms should have copper or brass mesh embedded in the wall structure to create a shield. This will create a safe area to locate computer file servers, routers, switches, STL gear, satellite receivers and the like equipment. Layered shielding with use of metal, gasketed door will improve shield performance. Retrofitting shielding is more difficult to accomplish than grounding and suppression. It is best done in new construction. 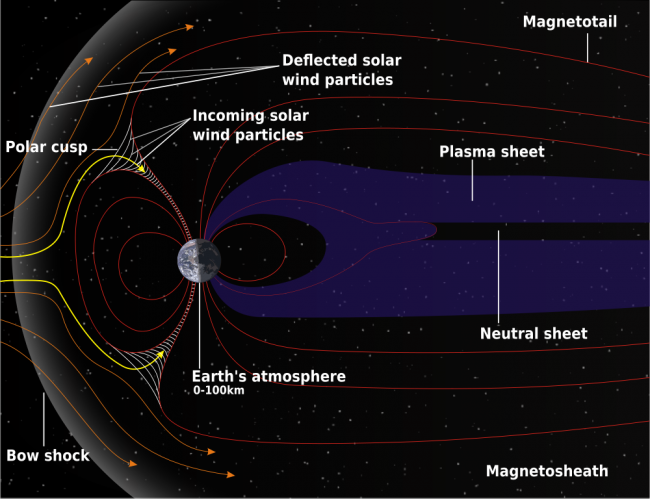 There are many different ways to accomplish even moderate shielding, which may serve well for lightning and solar flare induced EMP. From personal experience, investing an extra $10-20K in grounding and suppression at a lightning prone transmitter site in Florida solved all of the issues at that site. Prior to installing the ring ground and bonding, the transmitter was knocked off the air several times per year. Since the work was done in 2005, there has not been one lightning related outage at that site. See also: High Altitude Electromagnetic Pulse (HEMP): A threat to our way of life.